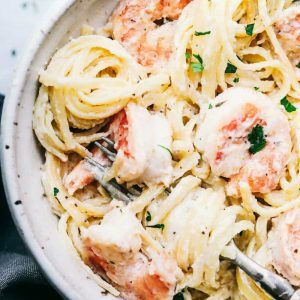 Creamy Garlic Shrimp Alfredo Pasta is such a classic meal that is brought to its BEST with Shrimp. 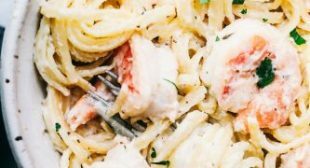 Thus meal tajes little effort and is so creamy and delicious the entire family will go crazy for! This Homemade Alfredo Sauce is one of the top recipes on the blog. We make so many delicious recipes with this sauce including, Chicken Alfredo Roll Ups. Serve it with some homemade garlic bread to complete your meal! We make Alfredo Pasta every single week at our house. It is one thing that I can count on my kids eating every week. My eleven year old son actually makes it for us and has it memorized. I am always trying to figure out different pasta to serve it with and different proteins to add into it. 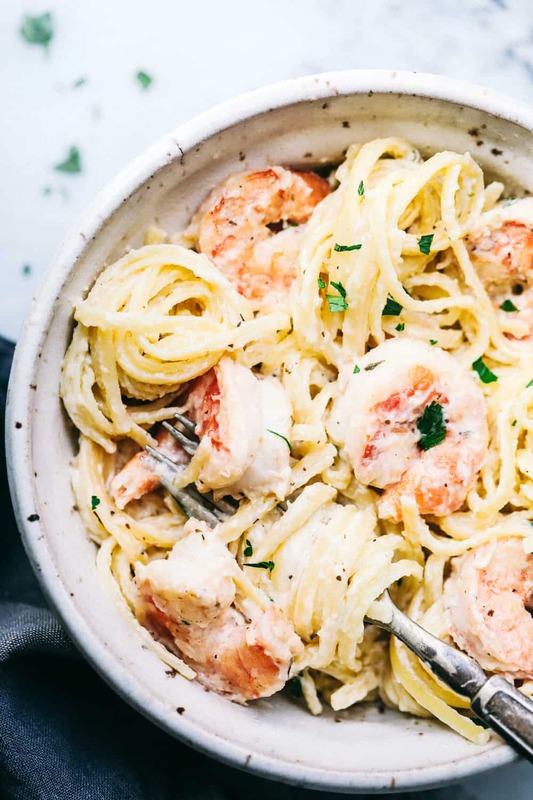 And this shrimp Alfredo Pasta was a sure hit! 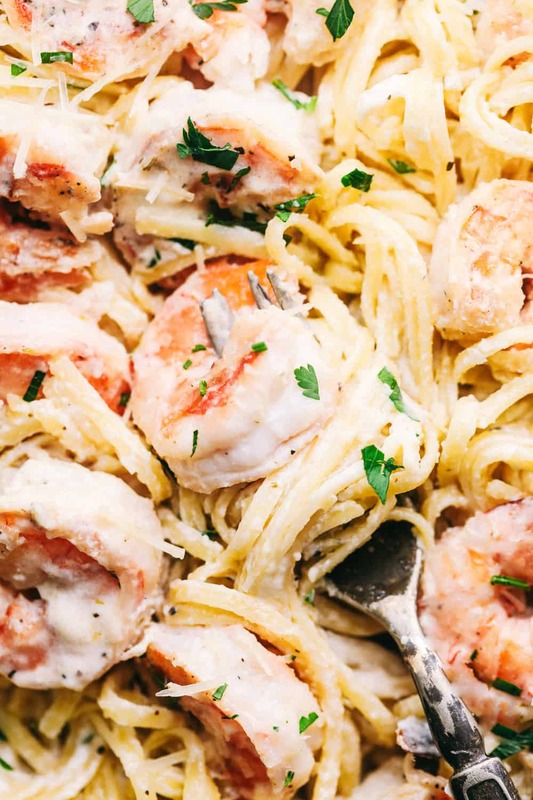 I absolutely loved the hidden creamy shrimp in the pasta. 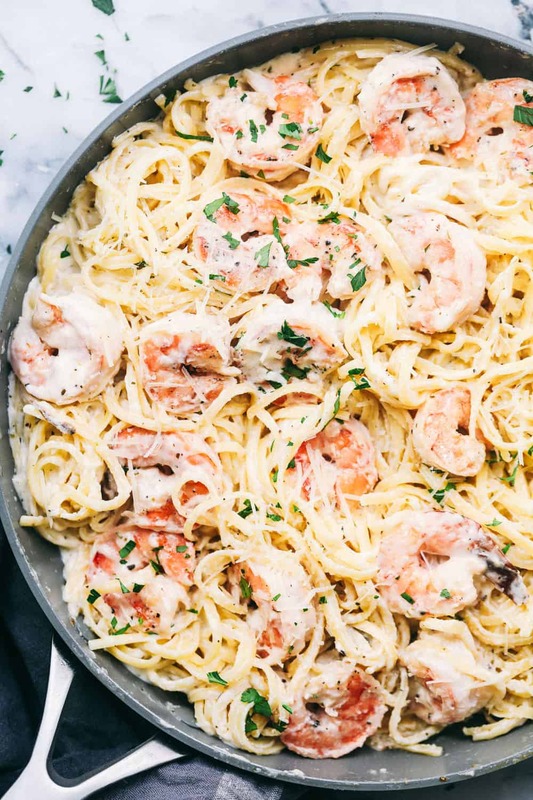 I promise you this Alfredo Sauce will be the creamiest and best that you ever eat! You will make it again and again! How do I Devein Shrimp? 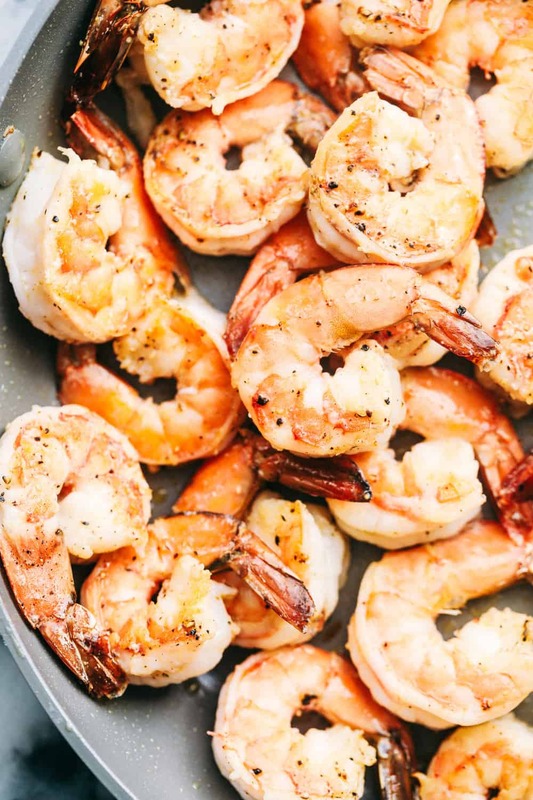 Peeling and Deveining Shrimp can sound very intimidating, but can actually be very simple. Start with the bottom of the Shrimp where the legs are. Stretch the Shrimp to more of a straight position and lightly pull the shell outwards from the legs. After it’s peeled, to Devein the shrimp make a shallow slit down the back of the Shrimp where you see a black looking line. After the slit lightly stick your knife under the vein and gently pull out and simply wipe on a paper towel. 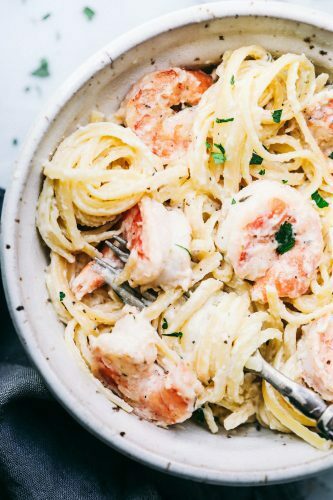 In a medium sized skillet over medium-high heat, add shrimp and olive oil. Cook the shrimp 2-3 minutes until they are cooked throughout and opaque. When Finished remove the shrimp and set aside on a plate. In a large pot bring water to a boil and add the Fettuccini and cook until al dente. Drain. Meanwhile, prepare your Alfredo sauce. Add butter, heavy whipping cream, and cream cheese. Cook over medium heat and whisk until melted. Add the minced garlic, garlic powder, Italian seasoning, salt and pepper. Continue to whisk until smooth. Add the grated Parmesan cheese and let simmer until it starts to thicken. Add shrimp and pasta to the sauce and toss to coat. The best thing about meals like this one, is that it’s so family friendly. Kids have a heard time being picky with it because there isn’t anything not to love. It’s also a meal that you can dress up with some more elegant sides for a romantic dinner with someone special. Try sides like these Cheesy Cheddar Garlic Breadsticks and Roasted Lemon Parmesan Garlic Asparagus. Both of these sides are family friendly as well, and fit in to any occasion. In a medium sized skillet over medium high heat add shrimp and olive oil. Cook the shrimp 2-3 minutes until they are cooked throughout and opaque. Remove the shrimp and set aside on a plate.